Members enjoy a special sense of belonging to the local arts community. By joining the FHAC today be the first to hear about upcoming events and programs, receive discounts for classes, and help to promote growth of the arts in our community. Click on link below to download our membership form. Our membership year runs June 1 - May 31. Membership payment can also be made via credit card and processed through our PayPal account. You don't need a PayPal account to participate. Please submit your membership form with credit card payment checked off. DO NOT include your credit card number. We will send you an invoice with the Pay Now button. 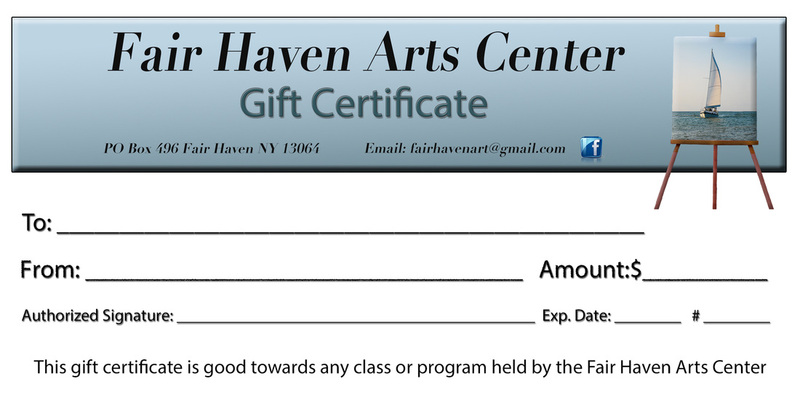 GIFT CERTIFICATES AVAILABLE FOR ANY CLASSES IN 2018.
email us or stop by the Hardware Café to purchase.